San Francisco is a spectacular city but if you’re like me, you may have only seen it cloaked in fog. So when the sun came out over the City by the Bay, I was determined to find the most Instagrammable places in San Francisco and take advantage of the beautiful weather. I’ve mapped out my favourite photo-worthy places. 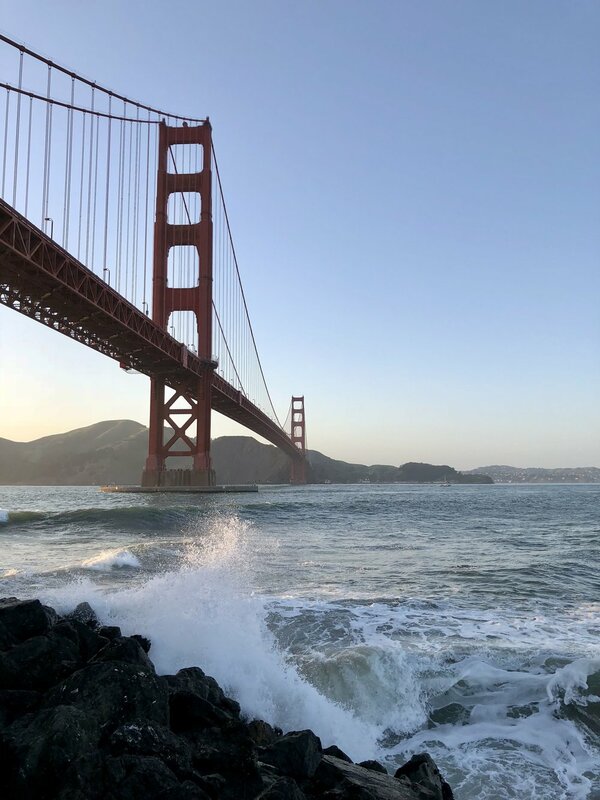 If the best place to see a San Francisco sunset and the Golden Gate Bridge is on your California bucket list then the Warming Hut and Torpedo Wharf should be your first stop. This was an incredible spot to watch the sun go down and snap some photos. The historical Fort Point is less than a 10-minute walk from the Warming Hut. This offers a really unique vantage point to see the Golden Gate Bridge and the Pacific Ocean waves crashing into the seawall. 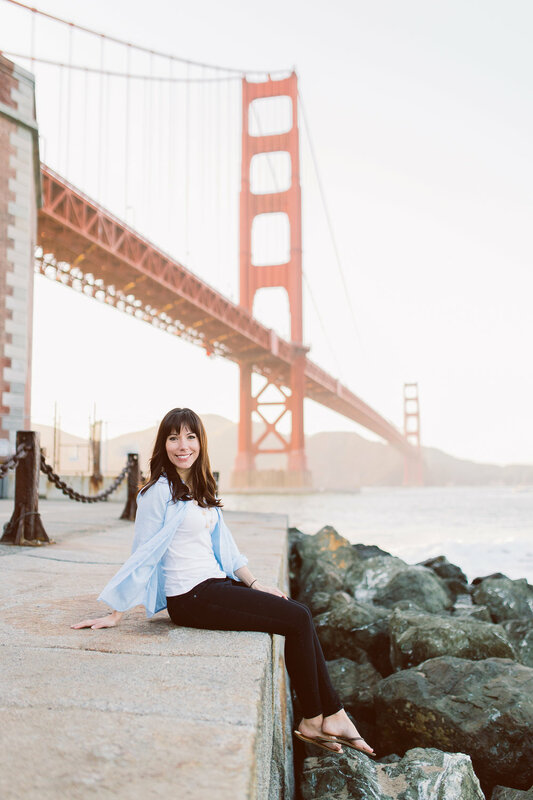 You’ll see professional photographers set up along the wall to take photos of the Golden Gate Bridge at sunset so you’ll know you’re in the best place. If you want to capture the most iconic San Francisco photo then you have to take a cable car. You can hop on and hop off the cable cars, and snap photos all day long. My new favourite place to take photos in San Francisco is the Palace of Fine Arts. If you’ve been following my Instagram stories, you’ll know I’m slightly obsessed with this gem. If you want to find parks, ponds, and historical architecture in San Francisco, then look no further than this location for the best Instagrammable spot. I was lucky enough to be staying at the iconic Fairmont San Francisco, a luxury hotel situated on Nob Hill, which offers breathtaking views of the Golden Gate Bridge and the Bay from many of its guest rooms, the Crown Room (like my Instagram post below), and the world-famous Penthouse Suite. Ask for a Signature Room or one of the Suites that offer feature picture windows and balconies with unparalleled views. Do you have other locations you’d add to the list of most Instagrammable places in San Francisco? Let me know! With all business travel I do, I rarely have time to explore the wonderful cities I get to visit. So when I was in San Francisco recently, I was on a mission to change that. With less than 24 hours in San Francisco of personal time, I hit the ground running – literally – to see the City by the Bay. I’d visited Tartine Bakery, a San Francisco breakfast institution, years ago but was curious about the new Tartine Manufactory. Like the name alludes, its massive compared to the original. But the food is equally fantastic and the extra space means you’ll have no problem getting a table. The Tartine Bakery Morning Bun is legendary as is the Strawberry Tartine with parmesan and ricotta (seriously, I never thought I’d like these flavours together). The Emmer Porridge with ricotta, spiced yams, and apple molasses is a perfect if you’re looking for something hearty. But in my opinion, the Tartine Bakery Egg Sandwich, which comes on a soft bun with cabot cheddar and bacon, is hands-down the best breakfast sandwich in San Francisco. And that’s saying a lot. All the hills in San Francisco make it easy to work off that breakfast. I was staying at the Fairmont San Francisco on Nob Hill (I learned Nob is short for “nobility” and is derived from it being an affluent neighbourhood) and it’s the perfect area to walk. There are loads of surrounding areas to explore by foot, like Pier 39 and Ghiradelli Square, however I opted to avoid the super touristy areas. I loved exploring neighbouring Chinatown. The architecture is eclectic, there are loads of reflexology shops to get your weary digits sorted (mmmm, yes please! ), and you can hop on one of the many cable cars that cruise by - so fun! Just a couple blocks away from the Fairmont is the Cable Car Museum, which surprisingly is free to enter. Cable cars are so symbolic of San Francisco so it’s cool to learn all about the history, and then to ride them and explore the area. While here, definitely visit China Live, awarded Restaurant of the Year in 2017, for lunch. I was so caught up with the food that I forgot to take photos. Sign of a good meal, right? Come hungry and be prepared to try everything, especially the dim sum. My favourite was the Xiao Long Bao 'XLB'. The room has several communal tables which is great if you have a group (although can get a bit noisy), an open kitchen, and a very cool retail marketplace when you enter the restaurant. I snapped a little video snippet of the entrance. I love learning about the history of a city so when I first heard about the Palace of Fine Arts in San Francisco, which opened in 1915, I needed to see it. The architecture is breathtaking – I felt like I was in Rome again – as are the grounds. If time allows, take a book and lounge on the grass near the ponds. I wish I’d had more time to relax there. And because I had only been in San Francisco in the rain, I was determined to see the Golden Gate Bridge in the sunshine. I made my way to Fort Point, a national historic site (noticing a trend? ), which is an ideal spot because it’s not as busy as other most popular viewing areas. I arrived just before sunset and was rewarded with the most spectacular views. My day was almost over but before I could leave San Francisco, I had one more stop to make. The New York Times called it “America’s Most Original New Restaurant” so when I was able to get into In Situ, I couldn’t be happier. Located in the San Francisco Museum of Modern Art (SFMOMA), Chef Cory Lee recreates dishes from the finest Michelin star chefs and restaurants around the world. The menu changes regularly but with a lineup like theirs, you can’t go wrong with anything on the menu. Needless to say, after a jam-packed day you need a night of rest. I couldn’t wait to crawl into my bed at the Fairmont San Francisco and dream about a return trip to City by the Bay. I know now, more than ever, that I need to spend more time in San Francisco. Have you been before? If so, what should I add to my list for next time?